Make fun healthy foods that the whole family will love! The terrines made from these veggies noodles are amazing and so delicious. 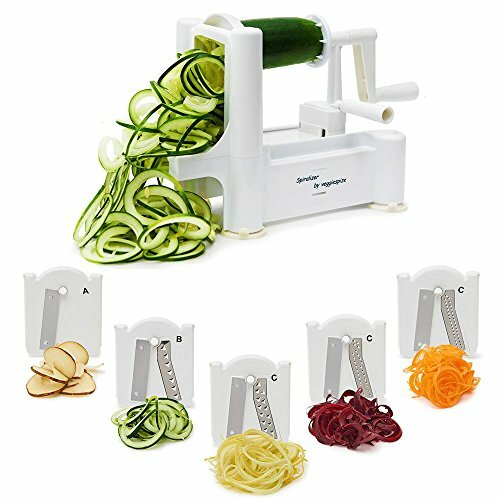 Make veggie noodles, , veggies Spaghetti, veggie ribbons, and perfectly even veggie slices in minutes. Includes 5 versatile blades to help you experiment with a variety of fresh and fun options like veggie lasagna, homemade curly fries, and angel hair zucchini pasta. NEVER GET BORED ON A KETO/LOW CARB, PALEO, RAW, VEGAN DIET. Make veggie noodles, , veggies Spaghetti, veggie ribbons, and perfectly even veggie slices in minutes. Includes 5 versatile blades to help you experiment with a variety of fresh and fun options like veggie lasagna, homemade curly fries, and angel hair zucchini pasta. Spiralize fresh tomatoes as a colorful meal decoration and wow your guests. SAVES YOU TIME- Never slave over a knife again. Now comes with 2 additional blades (ultra thin 2mm angel-hair blade and curly-fry blade) for a total of 5 blades for all of your Spiralizing! It is the only tool you need to prepare vegetable noodles, zoodles, ribbons and even slices. Stainless Steel blades and BPA Free. Start Making Healthy Gourmet Meals As Soon As You Get your Spiralizer! filled with nutritious, mouth-watering meal ideas the whole family will love! If you have any questions about this product by Veggiespize, contact us by completing and submitting the form below. If you are looking for a specif part number, please include it with your message.